1/13/14: Well, I've had my P85 for over a year and 20,000 miles now and look forward to every drive. I am updating my review and will attempt, as always, to provide fair and balanced information about my experience. Delivered pretty much on schedule December 19, 2012...after reserving on 3/27/11. Magical performance: deceptive speed with instant response...so refined. The silent, delay-free delivery of torque at any speed gives you sense of being "transported" from one place to another. After driving the MS for a while, nearly any ICE (Internal Combustion Engine) car feels sluggish and brutish. Silence: some folks like the roar, but I love gliding away and leaving that Porsche or BMW or Viper in my rear-view mirror and seeing them scratching their heads. You really can't tell the difference between 60 and 75mph without looking at the speedo (and I have the speeding tickets to prove it!). Incredibly functional: more storage than many SUVs, comfort for 5 (+2 kids with rear-facing seat option), carry bicyles, lumber, dogs...whatever (I've done it all). I love having a fast and luxurious car that is also functional and not a primadonna. iCar Interface: really usable, great control and configurability - and more coming (with over-the-air updates). Over-the-air Updates: it's great to get in the car in the morning and have new features and improvements to others. Even the throttle response profile, for example, has been improved through software to smooth out acceleration. Always-on Internet: love the streaming music, podcasts, etc...with voice integration. No more XM needed- another operating cost saving. who needs a start switch, let alone an "ignition"? walk up, door handles greet you...sit down, put your foot on the brake and the drivetrain is "enabled" (no real concept of "starting") and away you go. who needs to *tell* the car to turn off and lock? It *knows* when you're done driving (car in Park) and when you've walked away (FOB out of range)...just leave! That took some getting used to. I even used the app for quite a while just to check and see if it really locked itself. Yes, I've left my ICE cars on and unlocked for a minute until I remember! who needs a parking brake lever/pedal? when do I want to put it in "park" and NOT engage the parking brake? why should setting memories be limited to the seat and mirrors? and why tie it to the key? With the MS, I have as many drivers as I want and everything from their favorite music to their thermostat and screen settings are remembered. same for garage door opener settings...and it figures out which one you want to open from your GPS location! And, yes, the door handles are cool, but I didn't want to use that novelty as a primary driver in evaluating the car! 1/3/14: I have had 2 failures in the door handles. Service has been excellent, with fixes done by Ranger within hours...but, these are 2 of a pretty long list of mostly-nuisance failures (see list below). Filling up at home: plug in at night, always a full "tank" in the morning...and at 25-35% of the cost of gasoline (while reducing emissions). that's right - reducing...producing and transporting electricity and the car still takes resources of many types. The solar panels on my roof help, but there's still a cost to everything. Supercharging (see below for one failure): again, ICE doesn't need this, but it is a must to enable EV road-tripping. AND IT IS FREE! Know any ICE manufacturers including gas for your road trips? ...and I'm not mentioning all the "standard stuff" you'd expect from any car in this class. Anyone who has done Product Management recognizes that the compromises made to ship ASAP and reduce the cash hemorrhage at TM. Making sure the hardware platform was solid and the quality was excellent was more important than being "feature complete" - as long as v1.0 had the essentials and a few "silver bullets" to wow customers and reviewers (and could be upgraded over-the-air later!). I expect that there will be many improvements...of course, until software features start rolling out that require a hardware upgrade! Note that nothing below has had a significant impact on my ability to use and enjoy the car except my one failure with the supercharging circuit. 5/7/13: after living with it for a few months, I'm liking the big space where the console might have been a lot more. 1/3/14: I still like the big space, but a few more storage/organization spaces would be appreciate. The plastics also seem loose and/or too flexible in many places. 1/3/14: The (blue) paint on my car does not seem up-to-par with other cars in t his class. The paint seems "thin" and doesn't have the liquid look even when detailed. It chips and scratches easily. Again, I'm not a super-expert in this, but when I compare to other cars I think it doesn't measure up. The brake and accelerator pedals should be a little further apart - if you have EEE feet, you need to retrain yourself to avoid pressing both at the same time (which the car detects and warns on). While less-so than with other EVs thanks to huge battery and emerging superchargers, road trips, of course, require more planning (my tools here) and are subject to significant delays and anxiety. The Superchargers are great and make (some) road trips practical even by ICE standards. But the tools available to plan these trips are incomplete and difficult for the everyday driver to use. (see 'Energy App' below). My supercharging circuit failed on my second road trip - while it worked fine in Barstow on my LA-Vegas-LA run 12/19-20, it would *not* work when I was heading to the SF Bay Area 2/15/13 (had to leave the MS in Bakersfield and rent a car - which Tesla covered. Then picked it up on the way back and charged at an RV park to make it home). Other MSs were charging fine (at Tejon Pass) and despite engineers on-site and on the phone, they could not get my car to take a supercharge (DC) despite the conventional (AC) charging working fine. While any car can have a failure, usually you can tell if something is working properly before you leave home. I'm told there is no way to test supercharging circuitry without a supercharger...though I'm not convinced there isn't some kind of self-diagnostic that could be developed. How can I be confident leaving on a road trip again? 5/7/13: This turned out to be a software update issue with 4.2 that only affected some cars. The 4.3 update had my supercharging working again...not that anyone at the factory or service center told me about this. Energy App: neither the remaining range on the speedo (based on "rated" (EPA) or "ideal" (Tesla best case)) are adequate on their own to estimate how much further you can go - and it does nothing to help you *plan* a trip or find charging stations! Integrating the energy app with navigation (knowing where you're going) and internet weather (wind, temperature) would allow very accurate projections. I'm guessing that Tesla has something in the works, but I might not wait for them. 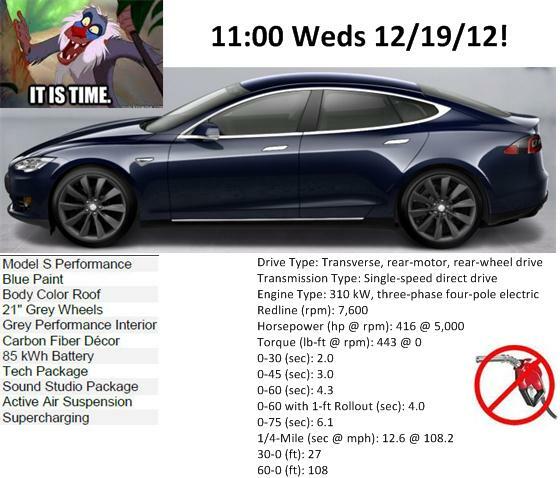 Tesla was not up-front enough about the impact of high/low temperatures and sitting unplugged on energy consumption. HVAC can decrease range 10-15% and just leaving the car parked in moderate weather consumes 12-15 miles or range per day. 1/3/14: We created our own EV Trip Planner! It is now used by thousand of Tesla owners every week covering all 50 states and 24 countries. Based on feedback from many users and our own experience, it is MUCH more accurate than using in-car tools or averages. TBD when Tesla might integrate this into their Nav. Charge Scheduling: to minimize the cost of charging, it is best to charge during super-off-peak hours. I'm not going to set an alarm to wake up and turn on the charging (through the phone app)...costing me maybe $20-$30 per month. I hear the feature is coming soon (already existings in Volt I think). Backup guides/warnings: it is a big heavy car with large blind spots - onscreen guides would help a lot (great HD wide angle backup camera is there). I would also appreciate some warning sounds if I'm about to scratch up my nice wheels, etc. These features are typical in cars of this class. 1/3/14: this was added as an extra-cost option. Tesla has reconfigured the options and now charges for other things that were part of the Performance or Technology packages before. It does seem a little cheesy considering the price of the car. Can I please have shuffle mode for the music on my USB stick? 1/3/14: how hard is this...please! 1/31/4: while connecting to WiFi was recently added, the promised in-car hotspot capability is not there yet. It is amazing how short this list is for a car that has so much that is brand-new from the ground up and is about #2300 ever shipped. Tesla seems committed to making everything right, though they seem a little overwhelmed sometimes. Nothing here has kept me from thoroughly enjoying the car and driving it nearly 4000 miles in 2 months (I look for excuses to drive places!). The paint has a lot of micro scratches/swirls in it - I'm sure this can be taken out with a good detailing (clay bar), but it should be flawless coming out of the factory. I expect if you point this out on delivery, Tesla will cover the cost of detailing. 1/3/14: see above - even with detailing, I believe the paint quality is not on-par with comparable cars. 1/3/14: many excellent super-charging sessions since...it is great! The temporary registration was not completed correctly - it was confiscated by the officer when I presented it to him (yes, one ticky-tack speeding ticket already!). They said they were going to apply for my HOV sticker (right, like I'm going to put a bumper sticker on this beauty?!) but didn't seem to. 5/7/13: in general, while the service rep is very responsive, and the valet service is great, they haven't done a great job as measured by actually fixing stuff. While none of these issues is very serious, none of the cars I've had that cost less than one third of this one had issues like this. The "simple stuff" in this car is less simple and more subject to failure - I hope that this won't be an ongoing problem for lots of drivers. While individually these issues are a nuisance, collectively they are a real pain. I wish I could just get them fixed and move on! 1/3/14: things seem to be fixed the first time now, so the team and knowledge seems to be improving even as their workload increases. Backlash developing in drivetrain (mild clunk in rear end when going from forward to reverse torque) - was told this was within spec, but it is getting noticably worse and wasn't there at start. I wouldn't think gearbox would wear that much that quickly. Rear tire accelerated wear (12k miles) - maybe just a "design tradeoff" due to very high camber on rear alignment, but they have since replaced some parts and made a bit less aggressive. Also, the disabling of lowering the car further (for battery fears) also makes the camber at high speed less aggressive. All that said, I am convinced of the Tesla team's commitment and dedication in resolving any issues that come up. Tesla has "owned up" to all problems (no attempt to charge for any of this) and nothing has interfered with my ability to love this car! It is an awesome car that competes with the ICE cars in this class and beats them in many ways. It is a ground-breaking EV that is heaven for gadget and car folks alike. It is MADE IN CALIFORNIA! It proves you can have a car you really want to drive and is good for the environment without compromising. Granted, it is more expensive than many can afford - but it is competitive in it's class and not premium priced relative to its ICE peers. In fact, total lifetime ownership cost could be less (TBD battery aging/replacement cost...and what is the $600 per year service plan for again?). It is worry-free for around-town driving, but does require some planning and patience for road trips as charger locations and charge time can be a challenge depending on your route. That said, road trips can be done and be real fun, but they do require more planning and carry more risks of delays than with an ICE car.